What we discovered was a very delighted young man, explaining why the economy is running red-hot. The number of new job offers, he said, is greater than the number of new job applicants. This hasn’t happened for 10 years. The number of people quitting jobs is also going up. “It shows people are feeling more confident about finding another job,” he explained. This, too, hasn’t been the case since before 2007. 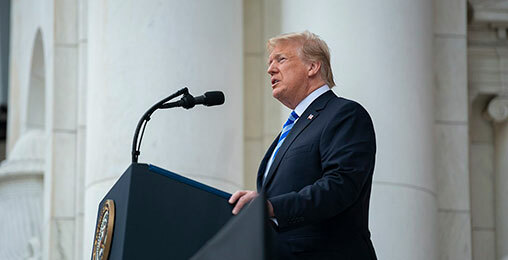 The National Federation of Independent Business released the results of its latest Small Business Optimism Index survey. The survey measures reported confidence in the economy among small business owners. Once again, that is back to levels not seen since 2006– 2007. The rate of business investment (CapEx spending), too, is back to 2007 levels. Job growth… GDP growth… stock price growth… confidence growth – we haven’t seen anything like this, he gushed, since 2007. It made us wonder… What happened after 2007? The sun shines bright… just before a hurricane sweeps across the bay. Today, as usual, we check the weather. According to the Bureau of Labor Statistics, prices in the U.S. are rising at a rate of 2.9%. That number is above the Fed’s current target lending rate – 2%. And it’s dead-even with the latest wage increase rate, too – also 2.9%. Taken together, what we see is that prices are keeping pace with wages and leading the federal funds rate – the rate at which banks lend to each other. There are three things that might drive inflation higher. First, the tax cut leaves more money in more hands. As these hands get rid of it, we can expect upward pressure on prices. Second, the feds are spending more money they don’t have. The budget deficit for August alone was more than $200 billion. This is money that was never taken from taxpayers (consumers), and so represents additional buying pressure. Third, The Donald’s trade war is bound to cause prices to rise. Already targeted are $200 billion worth of low-priced Chinese exports. Another $267 billion will be attacked if China retaliates. This will increase prices on essentially all of the imports from the world’s largest and most efficient producer. It is not hard to imagine that inflation will continue to rise… perhaps to the 4% range… dragging interest rates behind it… and bringing us back to what happened after 2007. 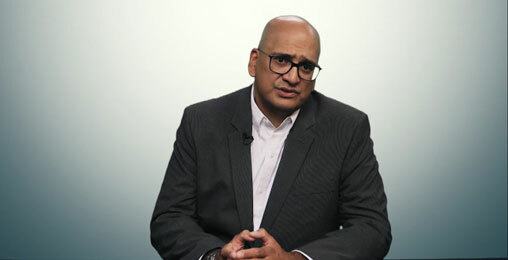 Tonight at 8pm ET, former hedge fund manager Teeka Tiwari is making his biggest announcement of the year. It has nothing to do with cryptocurrencies. 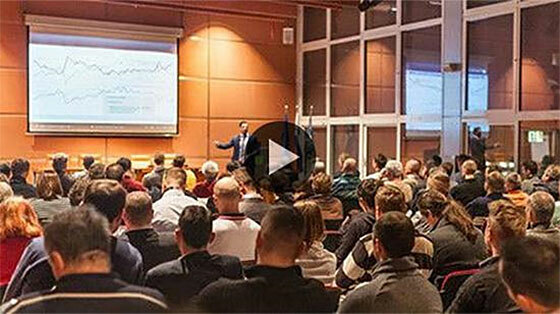 Instead, for the first time ever on camera, Teeka will reveal a brand-new strategy he’s spent half a year developing… a way to help you generate money month after month, with very little risk. To find out all about it, register for this special event here. In 2007, the Fed – making its classic Mistake #2 – raised its key lending rate to over 5%, which was enough to bring on the hurricane. In just a few months, all the delightful news headlines passed into history. The Dow was cut in half… the U.S. economy was in its worst recession since the 1930s… and the Fed was on to Mistake #3 (cutting rates in a panic). Which, in turn, brings us back to gold. The other thing the news reports of 2007 told us was that the ratio of the Dow to gold was around 20. That is, it took 20 ounces of gold to buy the Dow. That was about the same ratio as 1929. And about the same as the major top in the late 1960s. By 1980, the ratio hit its all-time low of 1. The ratio actually brushed 40 at the end of the 1990s – an all-time record. By 2007, it was at 20 again. Each time the ratio rose above 20, it was like 2007 all over again – followed by a bear market on Wall Street… and recession/stagflation on Main Street. And as stock prices went down, gold went up. Trump’s Infrastructure Boom: Already Started? That’s right. Trump’s infrastructure boom has already started. But he’s not building roads, canals, or bridges… Instead, he’s focusing on something even bigger. And savvy investors stand to triple their money as the boom continues. The Dow-to-Gold ratio eventually fell under 7 in 2011. What the ratio measures is the relationship of dreams to reality… of the future to the here-and-now… and of hope to raw experience. Right now, it tells us that – as in 1929, 1968, 1999, and 2007 – the ratio is above 20, signaling that stocks are too pricey. “Bitcoin got so much press over the last few years, no one noticed gold,” our Irish friend continued. 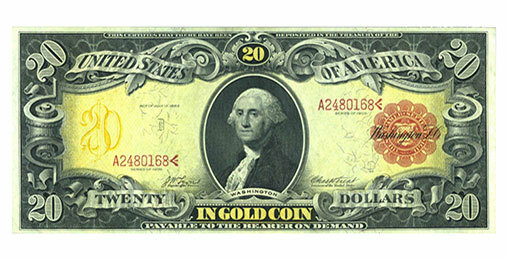 “It has been forgotten, and the price has drifted down while other assets have gone through the roof. Here at the Diary, we wouldn’t presume to guess the future. But this is hurricane season on the East Coast. Reports from Baltimore tell us that the city is unclogging its drains and sharpening its chainsaws. Hurricane Florence may be on the way… Or perhaps some other kind of storm. 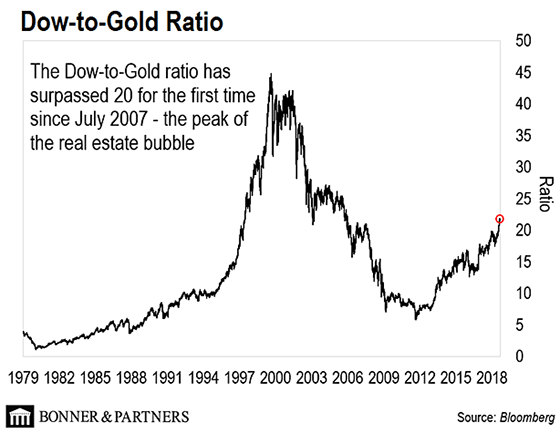 As Bill reported above, the Dow-to-Gold ratio is at its highest level since the peak of the real estate bubble in 2007. This ratio is simple – the Dow Jones Industrial Average divided by the price of gold – and it measures how cheap gold is relative to large-cap U.S. stocks. As you can see, the Dow-to-Gold ratio has surpassed 20 for the first time since July 2007 – the peak of the real estate bubble. The heightened ratio is the result of U.S. stocks climbing steadily higher as the price of gold has trended down since late 2011. From its all-time high of $1,895 in September 2011, gold has fallen 37%. Meanwhile, the Dow has climbed 126%. But as Bill noted, the last time the Gold-to-Dow ratio climbed above 20, the trend reversed… with stocks falling and gold going up. The crash in the cryptocurrency market this year has been devastating. Peak-to-trough losses are coming in at 80%. And those losses now exceed the fall in U.S. internet stocks when the dot-com bubble burst. My oldest daughter has lived in Switzerland for the past 14 years. I visit often. She lives in a farming area about 20 miles outside of Geneva. I have observed the decline of the small farmer and the decline of the farming villages. I observed the same thing happening in France when I visited the Normandy area. One of my classmates in architectural school, who is German, but was born and raised in Argentina, has a ranch about 60 miles outside of Buenos Aires. He has had to depend on his architecture practice to make a living because he can’t make a living on the ranch after 50 years of hard work. Sounds like your adventure in Argentina. The decline of agriculture in this country started about a hundred years ago. Agriculture is taking a beating almost everywhere because of big corporations, big food producers, and big farming companies. And now, because of the rising cost of putting food on our tables from local farmers, international agricultural products fill our grocery store shelves. It has become more important to extend the shelf life of the products we consume than it is to extend the shelf life of the people who consume them (processed and genetically altered). It is a pleasure to read your description of what you witnessed at the farm fair. The machine the farmers were operating may be old and outdated, but the atmosphere was a pleasant one. It is so different from the city life, where every man and woman is so focused on wealth or power-seeking. In country farms, people are more supporting and caring. Who would even stop and exclaim, “Ohhhh…” when a car breaks down on a city road? I recall the words of a Japanese general on the scaffold. When asked if he had any last words, he replied, “If we had won, it would be MacArthur here instead of me.” The “traitors” that tried to assassinate Hitler paid a terrible price. If they had succeeded, they would have been heroes. Since we won, they are heroes. I don’t know if Trump is a hero or a villain. Your readers don’t, either, but believe they do. I wonder – do they use a crystal ball, tarot cards, or an ouija board? They have apparently taken a complex, unknowable issue, and simplified it to a level that their simple minds can grasp. The arrogance, conceit, egotism, and self-righteousness of some of your readers regarding the “traitor” in the White House (on either side) is quite disconcerting. Join us from October 17–19, 2018 in Bermuda for our first-ever Legacy Investment Summit. This is our largest conference ever, and the speaker list will blow you away. If that’s not enough, the location is a true vacation destination with every amenity at your fingertips.